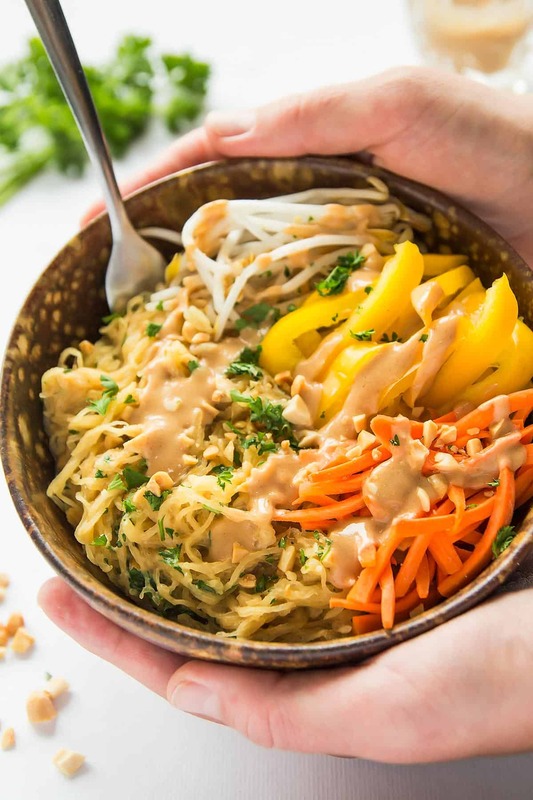 Healthy Thai Spaghetti Squash with delicious peanut sauce makes a great side dish or base for a grain-free Pad Thai recipe. This recipe is gluten-free, vegan, and clean eating. The peanut sauce makes a great dip too. My first encounter with spaghetti squash was when one week we had 3(!) spaghetti squashes in our CSA box. I had never cooked with that vegetable before and now I had to come up with a way to use 3. For my first try I followed a cookbook recipe and really liked the result. And it also inspired me to take things further. Eating the vermicelli-like spaghetti squash strands, I was taken back to Thailand’s amazing street food markets. It felt like I was eating Thai noodles. So I set out to make Thai spaghetti squash noodles. That was some 2 years ago. This Thai Spaghetti Squash recipe has turned out to be super popular (especially on Pinterest). 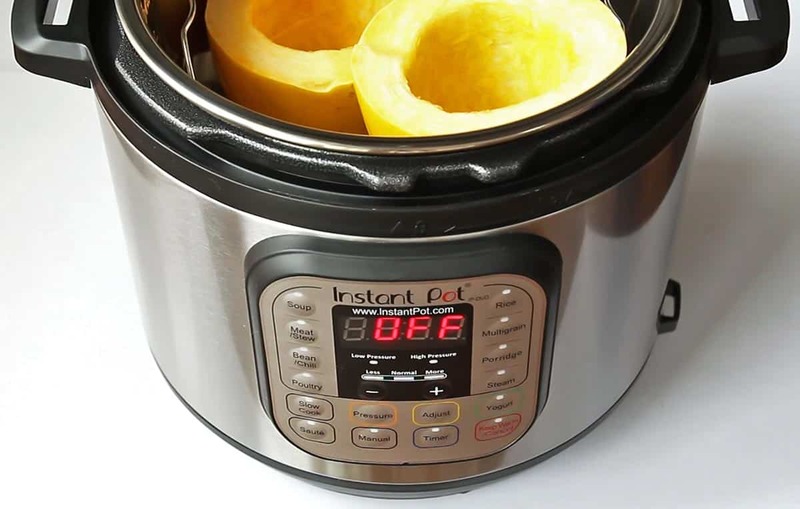 Now, I am circling back to this recipe with a new way to prepare spaghetti squash in the Instant Pot, a quick video tutorial (scroll to the top if you missed it), a new serving suggestion and improved photos. There are 3 easy parts to this recipes. First, the spaghetti squash needs to be cooked. Cutting the squash along the width instead of lengthwise results in extra long noodle strands. Originally, I was roasting the spaghetti squash in the oven. But since getting my Instant Pot I always go with the Instant Pot Spaghetti Squash method, because it only takes 10 minutes(!!). Even less at sea level. I have the 6-quart 7-in-1 DUO which you can usually get on Amazon for the best price. While the squash is cooking, you can prepare the creamy peanut sauce that gives this dish its distinct Thai flavor. The combination of coconut milk with all natural peanut butter already give the sauce a Thai touch. Then I am also using coconut sugar (also called palm sugar), which is the sweetener used in Thai curries. But what really puts this sauce over the ‘Thai edge’ is the red curry paste in it. Using curry paste is a shortcut to getting the unique Thai spice blend, since the individual ingredients (like galangal and kaffir lime) could be difficult to source. This is my go-to curry paste, but it is not vegan because it includes dried shrimp. To make this recipe vegan I recommend this curry paste. Another Thai touch I like to add is fish sauce. 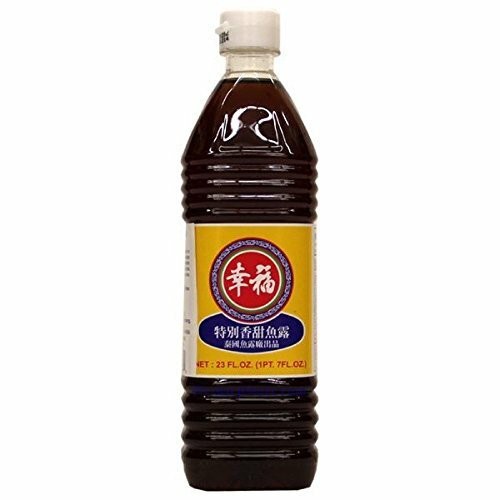 You can usually find fish sauce near the soy sauce in your grocery store. If not, there is always Amazon. This is the same brand of fish sauce we also used while we lived in Thailand. But again, this is not vegan. The vegan substitution here is soy sauce or Tamari (to make gluten free as well). Even Liquid Aminos can be substituted. The instructions below make a lot more peanut sauce than you need for 1 spaghetti squash. However, I didn’t want to use just part of a can of coconut milk. The hassle of then transferring the remainder to another container and trying not to forget said container’s existence in the fridge, isn’t worth it for me. Instead, I make a big jar of peanut sauce that I can use to quickly dress up some pasta, or veggie noodles and it also makes a great dip. I have made fresh spring rolls with spaghetti squash, which are perfect to dip in this peanut sauce. It also is the sauce I use on my Thai Buddha Bowl. 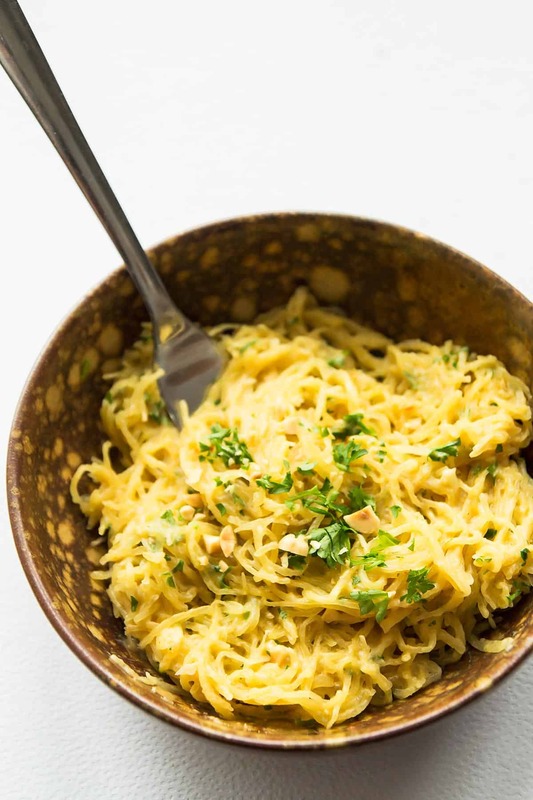 Once the spaghetti squash and peanut sauce are prepared, they are combined with some garlic, parsley (you can also use cilantro, if you like) and crushed peanuts. And voila, you have this plate of awesomeness that is basically veggies with sauce. If you like to think along those terms. 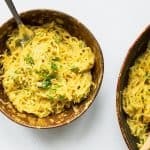 Many readers have commented, since publishing of the original, how they like to use this recipe to make a sort of grain free Spaghetti Squash Pad Thai (although original Pad Thai isn’t even made with a peanut sauce). For that they are adding items like sliced veggies and/or chicken to the dish. I have started to just add bean sprouts, sliced peppers and carrots on top of my peanutty spaghetti squash bowl, although you can definitely cook/sauté them first. 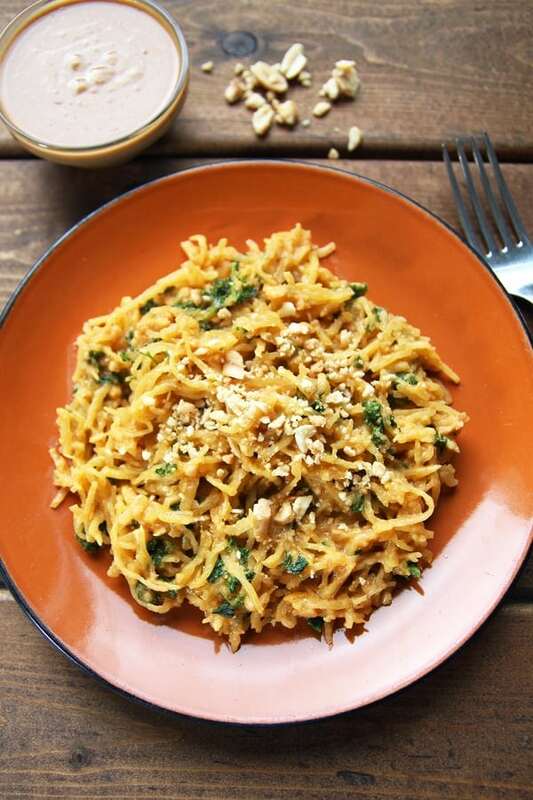 Healthy spaghetti squash with delicious Thai peanut sauce. 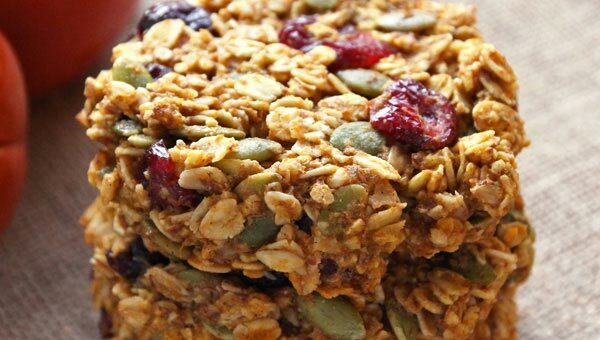 This recipe is gluten-free, vegan, and uses no refined sugar. The peanut sauce makes a great dip as well. Preheat oven to 350 F. Half the squash and scoop out the seeds. Drizzle inside with olive oil and sprinkle with salt. Place spaghetti squash cut side down on a baking sheet and roast for 25 minutes. When spaghetti squash is done roasting, take it out from oven and let cool for 10 minutes. Then, using a fork, scrape out the spaghetti squash strands. If your squash is very moist, you might have to place the strands in a colander and pat with paper towel. With a small sharp knife cut the spaghetti squash in half widthwise. Use a spoon or small knife to remove the seeds. 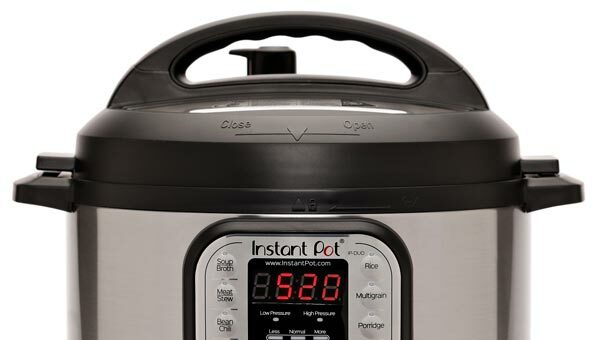 Pour 1 cup of water into your Instant Pot. Add a trivet and place the 2 spaghetti squash halves on the trivet. Orientation doesn't matter too much, but I always do cut side up. Close the lid and turn the valve to sealing. Select the 'Manual' setting and adjust to 10 minutes. Once the pressure cook cycle has finished, turn the valve to venting to quick release the pressure. Open the lid and pour out any liquid that may have collected inside the spaghetti squash halves. Test a few strands for doneness. You can always add a few more minutes for softer texture. Let the squash cool until comfortable to handle. Use a fork to loosen and scrape out the spaghetti squash noodles. Place all sauce ingredients in a medium saucepan and bring to a boil over medium-high heat. Then turn down to low and simmer for 5 minutes to thicken the sauce, while stirring almost constantly. Heat a skillet over medium heat. Add minced garlic, chopped parsley and 1/4 cup of the peanut sauce pan and combine. Add spaghetti squash and crushed peanuts, stir to combine and cook until heated through (about 2 minutes). Plate and garnish with a little more crushed peanuts and chopped parsley. 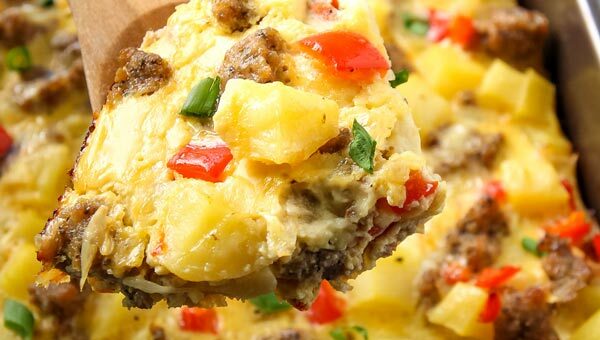 Optionally, serve with veggies of choice. I used bean sprouts, sliced bell pepper and carrots. Drizzle with more peanut sauce as desired. Nutrition data is based on 1/2 half medium-small spaghetti squash and 1/8 cup of sauce per serving. Disclosure: Instant Pot has generously sent me one of their electric pressure cookers to use in this video. This post includes affiliate links. If you make a purchase after clicking on one of these links, I may receive a small commission at no extra cost to you. Thank you for your support in making Leelalicious possible. I really appreciate it! Great reviews but this wasn’t my favorite. It was just too “peanuty” (and I love peanut butter). It would be great as a chicken satay dip. Also, I wish I had really paid attention to the instructions and saw that you only end up using 1/4 cup. I would’ve totally cut the sauce part in half. Much better ways to use spaghetti squash, in my opinion. Amazing!! We doubled the sauce so we could feeeze it for a 2nd round. We added a touch of saracha to the sauce to give it a kick. Also sautéed a yellow pepper and some soy and fish sauce marinated chicken to give it a little more substance. This will definitely become a staple! This was delicious. I used leftover sauce to make a quinoa chicken bowl with Thai veggies. It makes a large batch of sauce. Can the sauce be frozen? 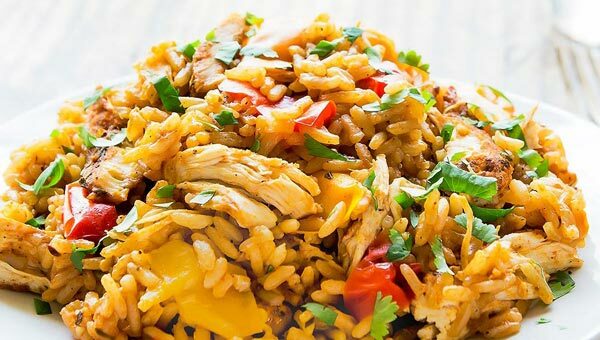 What an absolutely fabulous recipe – loved it! We added shredded carrot, red peppper and shrimp and served as a main dish. We received rave reviews from our guests. Our only disappointment was that we had no leftovers . Thank you for sharing. Awesome! Hi there, I am excited to try this recipe but had one question (I tried to look in the comments but did not locate). What is the 2/3 c natural supposed to be? Peanut butter maybe? Thanks! I made this tonight and it’s seriously delicious! I threw in some chicken meatballs to complete the meal and I thought it was great. My calorie count is coming in a bit higher though when I add it all up. Chicken meatballs sound like a great addition! And I bet that they would also call for a little more sauce. My nutrition calculation was definitely just an estimate, but in included about 1/8 cup of sauce per serving. I have never tried it with the sweetened kind of peanut butter. Using all natural peanut butter makes it really a lot more like they do it in Thailand where whole peanuts are ground into a paste with mortar and pestle. But if reducing the peanut butter works for you, go for it. Wow Butter! It’s made from dried soybeans. I just made this and it was fantastic! Thank you!! This is the best peanut sauce recipe I have tried! I increased the amounts a little to make more sauce and also cooked up some fettucini to spread the meal for a larger crowd. It was so delicious! I am excited to try it next time with tofu, chicken, or quinoa (alongside the spaghetti squash of course). Thanks for sharing this one! Thank you so much Wendrika! I absolutely love this peanut sauce too. Love all the ways you are stretching this recipe to feed a crowd. Thanks for the tip that regular PB worked for you here. I love the sauce on everything! Like this grain bowl http://leelalicious.com/thai-style-buddha-bowl/ or even as satay-like sauce on chicken. I’m excited to try this recipe, but I’m out of peanuts! Do you think I could make an almond butter instead? Or should I just go buy some peanuts… haha I was thinking even tahini might work? Hmm, I am not sure. The peanut sauce is what makes this dish Thai for me. So I am not sure if I’s like it in Almond flavor. But you could certainly give it a try. I am excited to try this. Have you made this and added meat? I have two little boys and they are meat lovers. I am thinking chicken – do you have any ideas on how I could incorporate it? I made this last night and my 7 year old LOVED it – even asked for seconds! Thank you! Enjoy Kenelle! I love this sauce to dip fresh Vietnamese spring rolls in. What a great recipe! Super tasty and easy. We always cook our spaghetti squash in the slow cooker, which saves heating the whole house with roasting it in the oven and that worked out great with this recipe. We started eating it and my husband said “We need to buy more spaghetti squash so we can eat more of this!” Big hit. THanks for a great recipe. So how many 1/8 c servings does the sauce recipe make? Making more than one squash so wonder how many batches of sauce I will need! Thanks! If I remember correctly I used about 1/5 of the sauce (1/4 cup) per spaghetti squash. So that would make 10 1/8 cup servings. Does the nutritional information include all the sauce and not just the 1/4 cup used? Hi Sam, it’s been a while since I calculated these so I just went back in the comments to find the reader who requested the nutrition information. In the reply I said that I based the calculation on on using 1 spaghetti squash and 1/4 cup sauce for 2 servings. The numbers are for 1 serving (1/2 squash + 1/8 cup sauce). Hope this helps. I’m really excited to try this recipe! Just one thing I noticied…it says it is gluten free but soy sauce is not gluten free so in order to make it gluten free, you would just need to substitute tamari. I’m sure it will turn out delicious! Would love to hear what you think when you try this recipe! I made this on 11/2/15. This was fantastic! Easy to make and very tasty. My husband couldn’t even tell it wasn’t real noodles. Next time, I’ll increase the curry paste – when I tasted, it seemed like enough, but after adding the squash, I feel it could use more (and I don’t even like spicy). It seemed like a lot of sauce, but the “noodles” really soaked it up. I added chicken, broccoli, cilantro & lime juice and served it as dinner. I’m a professional cook, and this was the first time I’ve ever cooked spaghetti squash. I will absolutely make this again! Really a great dish! I’m always looking for new ideas for spaghetti squash besides garlic & parsley butter – nothing wrong with that all btw, but this is just delicious. Thank you! I saw it for the first time last year and I couldn’t believe it. I have no idea how the locals cook it but this year I’m going to find out. 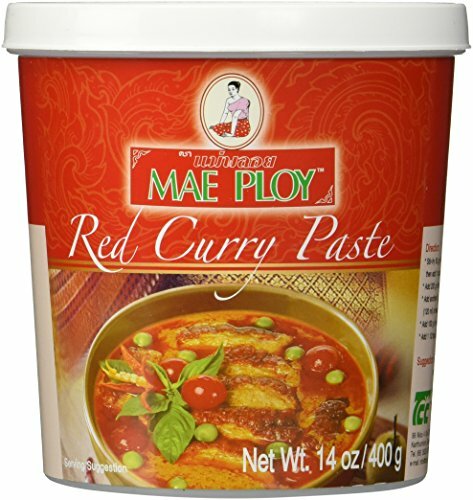 Can I sub red curry paste with yellow curry paste so that it is less spicy? I am so sorry for the late reply Jenn, but yes, yellow curry paste should work just as well. Just made this for dinner and it was a hit. My gal and I loved it. Thanks so much for the recipe! Hi.. I’m from the UK and can’t find anywhere to purchase a spaghetti squash 🙁 Do you think replacing it with courgette spaghetti would work? Oh no. No spaghetti squash in the UK? But I really don’t see why courgette noodles wouldn’t taste just as yummy in this recipe. I don’t have experience making and preparing courgette spaghetti (here we call it zucchini noodles or zoodles). But from what I read they aren’t really cooked. So if you just sautee them with the garlic and then the peanut butter sauce that would warm them up nicely. Hi Angelica, many people tell me they are adding a protein like chicken or shrimp to this dish. If you’d like to keep it vegetarian, you can add some Pad Thai style veggies, like bean sprouts, carrot sticks, green onion (maybe red bell pepper). Or some oven-roasted vegetables (cauliflower, broccoli…) on the side would be nice too. What is spaghetti squash and how do you make it. Usually available in the produce section in the winter months. Cooking instructions are included in my recipe. This looks awesome! Trying to eat healthier this year and excited to try this. Going no sugar though….do you think the sauce would still taste good with no sugar added? Hey NJ, coconut milk has a natural sweetness to it. So especially if you are already used to no/low sugar eating I think you will still enjoy the sauce. This looks incredible!! Going to make tonight with chicken in it for a bit of a protein kick! Is the calories here for both servings or is it for 1 serving?? I assumed for both since it says 2 servings but I wasn’t sure and then that way I can see how much chicken I can have with it!!! Thanks so much :). Hi Elle, sorry for the confusion. The nutrition facts are for 1 out of 2 servings in the recipe. If you are serving it as a side, there are more like 4 servings in the recipe. As a main, it serves about 2. I hope that helps? would that be toasted sesame oil or plain? Hey Marie, I wasn’t aware that there are different kinds. My bottle simply states 100% sesame oil. But after a little research I realize mine must be toasted sesame oil. It is dark in color and has a strong flavor. hi, I don’t have sesame oil on hand. Any substitutes? Hi Sutton, sesame oil has a very unique, strong flavor. But it doesn’t do anything for the texture of the sauce. So you could just omit it or, if you happen to have tahini (sesame paste) that would give a similar flavor. Sounds awesome! Do you have any idea on the nutrition information for this? I know it varies drastically depending on what is used but just curious. Hi Kati, I tried to calculate the nutrition facts best as I could. See them at the bottom of the recipe box. Calculations are for 1 squash with about 1/5 of the sauce recipe. Numbers are based on 2 servings. Hope this helps, but definitely keep in mind that they are only approximations. Very creative version of spaghetti squash. Loved it! And the peanut sauce is so very tasty. I saw your note about spring rolls in your future. My thoughts exactly. I was wondering can I substitute red curry paste for something else or can I leave it out? Hi Yasmin. The red curry paste is quite essential as it gives the sauce its Thai taste. Trying emulate it from scratch would require a lot of ingredients, some of which are hard to get by in North America. You could try a mix of curry powder and chili flakes for at least some sort of spicy curry flavor. But it will not be the same. Thank you Rachel! Maybe adding some protein (like chicken or shrimp) or some other vegetables will absorb some of the peanut flavor for you? Can you make the sauce the night before and store it in the fridge? Absolutely! I always store the remaining sauce and use it in the following days. Omg, this peanut sauce is perfect!!! Such a simple and delicious recipe! I just made this for a potluck dinner tomorrow and I can’t wait to eat it. I hope the rest of the guests enjoy it too :). Thanks for the recipe! SO Delish! I love spaghetti squash …so I had to try this recipe. It is definitely on the rotation. YUMMMM!! Regina, you are so sweet! Thanks for sharing my post. I absolutely love to spread the spaghetti squash love far and wide. 🙂 And now I have discovered your delicious idea for peanut sauce on spaghetti squash and can’t wait to try it out! so good! I had all the ingredients on hand! Thanks for the idea! I like to slice my squash into rounds and roast them without olive oil at 375 for 40 min. This leaves long strands like spaghetti instead of the short strands and I also think it keeps it from getting mushy if over cooked! That’s what I did. Works well but you may need to cook longer. Five stars!!!! I added some siriacha, carrots, and green onions. AMAZING!!! Thank you!!! Thank you so much Stacey! Love your yummy additions. Do you only use 1/4 cup of the sauce for the whole squash? That’s what I did Sherry. I only wanted the spaghetti squash to be lightly coated in sauce, not saturated in it. However, tastes differ and so do spaghetti squash sizes. So feel free to add more sauce to your liking. Thanks for sharing this recipe and photos online. Made this last night and it was delicious! Ours didn’t quite turn out like yours, our squash was super watery. Not too sure if cooking the squsg for an extra bit of time made it like that, but it made the meal more of a soup (even after trying to pat it with paper towel) but oh well it tasted good, so thats all that matters. I also didn’t have parsley so added to the peanut sauce some sliced kale and thinly sliced peppers. Yummy! Mmm..I have heard of some spaghetti squash being very watery. I’ve had 5 different ones this season, from different sources. None of them were watery though. I am happy to hear you still could make it work. Better luck next time? This was delicious – like a squash pad thai. I served it with chicken satay (had planned to use the extra sauce to dip the chicken in, but honestly there was enough flavor in the squash and the chicken marinade I didn’t need to) and a quick marinated cucumber salad. Hopefully it freezes well, I’m thinking it should. I cook for one and so I made a whole squash worth and plan on freezing the remaining 3 portions for what will be the best work lunch ever. I’ll try to remember to come back and comment with an update. This recipe looks delicious but I’m allergic to coconut! Do you have any recommendations of substitutes for coconut milk and coconut sugar? 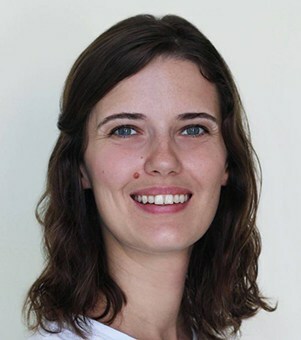 Hi Kate, you can definitely use brown sugar in place of coconut sugar. Regarding the coconut milk I am not so sure. Maybe almond milk? It might still give a certain nutty flavor, unless you are allergic to nuts in general. Then I would just give regular or soy milk a try. However, I have never tried any of these substitutions, so no guarantees 😉 Let me know though if you try it with some other milk. I am sure it might be good to know for someone else with allergies. Tried to make the peanut sauce with pb2 powdered pb for a lower cal version and it worked out nicely! Just took a little while longer to thicken up while simmering. I love peanut sauce and I love squash, never thought to put the two together! I added some chili flakes for a little added kick. Thanks! I was just wondering how PB2 would do in this sauce… Thanks for sharing! How long will the leftover peanut sauce keep for? I made a few batches and keep them in a mason jar in the fridge. They are still fine. Just used it again on the weekend. So I would say 2-3 weeks no problem. Will have to see how long from here; if it will last that long. I never thought to use it in a non-Italian inspired dish! This is exciting, thanks for the idea! Delish! I omitted the water because I prefer a thicker sauce. So great! Thanks! So happy to hear that you enjoyed this Mary! 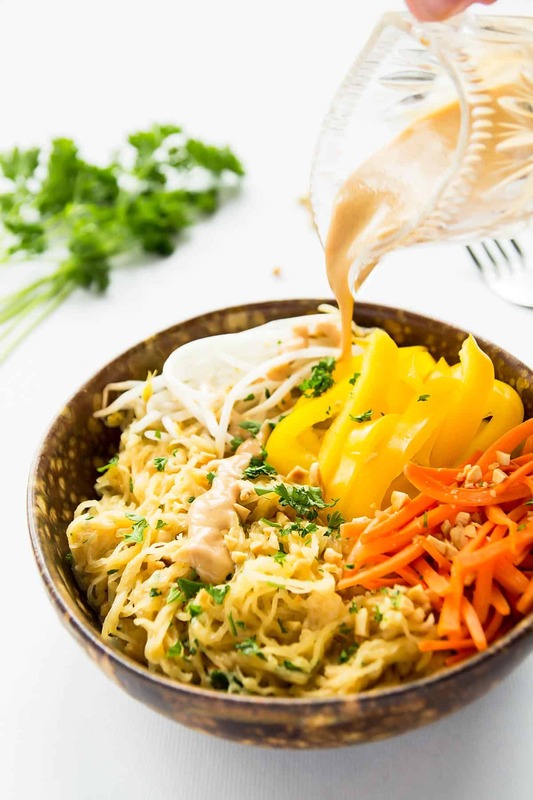 A fantastic low carb meal, and that peanut sauce sounds heavenly! That sauce really is da bomb!! I LOVE spaghetti squash! I didn’t experience it until I was in my teens and mainly because I was fascinated with the idea of squash that looked like noodles!! I love that you have married my love for thai with squash. YUM! So happy you like my fusion food idea. I just couldn’t help it. As soon as I tasted the noodle like squash all I could think about were Thai noodles.